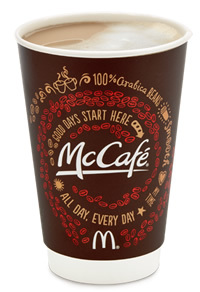 McDonalds or McCafe Latte is made with espresso and steamed milk and served at McCafe's around the world. Their Latte is also available with added syrups and comes in three sizes. Caffeine can vary in espresso based drinks, so the above numbers represent the average amount to be expected. See our McCafe Page for complete McCafe Caffeine Amounts. Sugar content: 15 grams (per 16 ounces). How Does McDonalds (McCafe) Latte Compare? McDonalds (McCafe) Latte contains 8.88 mgs of caffeine per fluid ounce (30.01mg/100 ml).